Join us for the first meeting of the New Year! 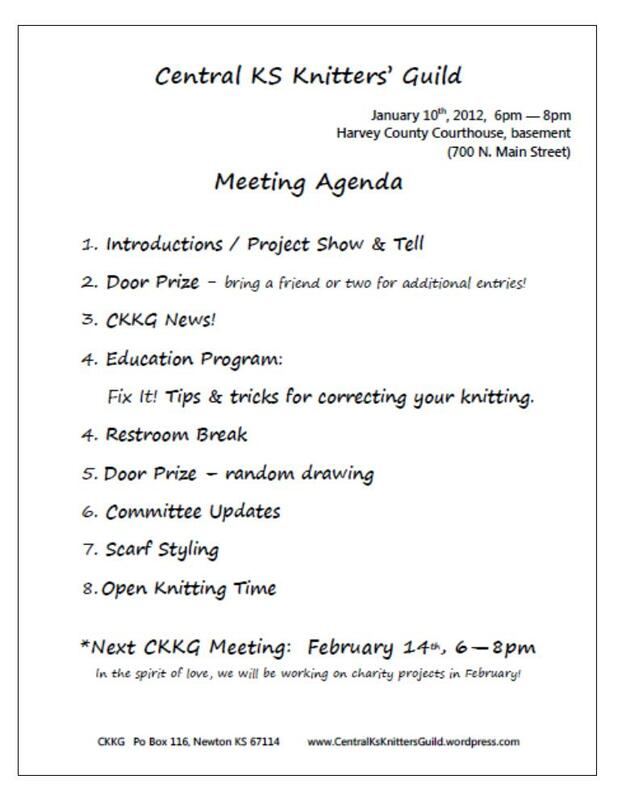 CKKG meetings are now held on the 2nd Tuesdays. January 1oth from 6-8pm at the Harvey County Courthouse (Newton, Main & 7th streets). *Check our Ravelry page or contact us for carpool details. We have an exciting agenda, Scarf Styling demonstration and several announcements! Also, bring friend or two to enter our special door prize drawing! You will receive 1 entry per guest you bring! Next Next post: January Meeting Recap! I just wanted to let you know that I thoroughly enjoyed last Tuesday’s meeting. I never even thought about using the ‘vertical correction’ to change knit stitches to purls. I did end up using this technique this weekend while working on a scarf and was so excited! Also wanted to mention that it would be great to do some educational sessions on joining yarn (was browsing ravelry, and folks had mentioned the ‘Russian Join’ and ‘Lucy’s Braided Join’. I would also love to hear techniques for weaving in ends. Hope you had a good time at the executive committee retreat!